Ever forgotten about a meeting? Lost a useful contact’s phone number? Wondered if your team are on top of their tasks? Or worried about which invoices are still unpaid? 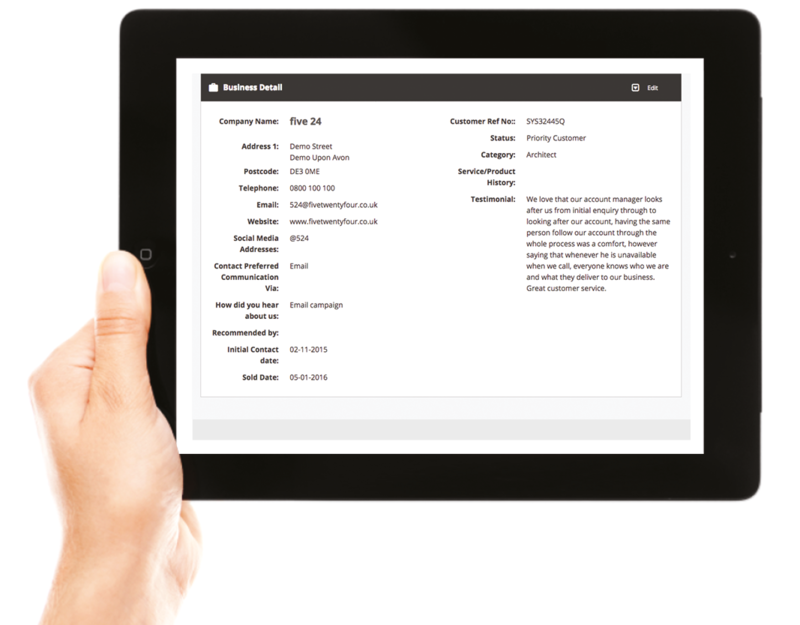 Create your own bespoke business data profiles with an easy to use Management Dashboard. 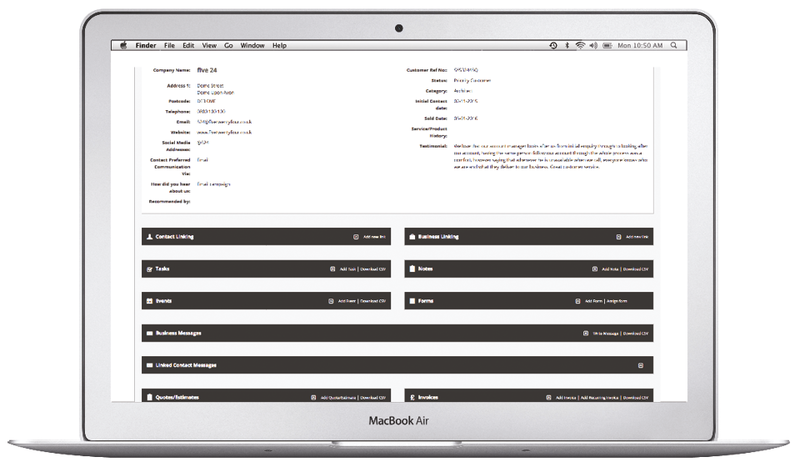 4CRM Management Dashboards are easy to set up and use for all of your contacts. The more organised and informed you can be about customers, supplies and/or business partners, the more professional, streamlined and efficient your business will become. No two businesses are alike; with 4CRM you can tailor the fields within your dashboard to choose what data you want to collect. You will be able to see every Note, Task, Event, Message, Form, Quote and Invoice that has been added and sent to every contact on your system. This ensures your whole team is up to date and well informed about every customer you have. Every business collects different data about their customers. With 4CRM you can add as many fields as you like to make sure you and your team capture the information you need to keep your customers happy. Simply go to Manage Fields, add a field and then position the field using simple drag and drop within the Manage Field Menu. For example, if you want to capture the customer’s initial contact date – just add this as a field and the field will display on the record, ready to start adding data to it. Business Category – Track who your customers are, great for profiling so you can see at a glance who your customers are for example, Electrical Contractors, Marketing Agency, Building Contractors, Transport, Educational Institution or Consumer. Status – Know where your customers are in your pipeline, this helps track and follow up customers so nothing is missed. For example, are they a prospect, existing customer, hot lead, lost customer or supplier. Once you have finished setting up your fields you can add contacts and businesses one by one or if you would like you can import batches of data. Simply map the fields to your headers and click import. Export your data whenever you need to. It is important for any business to have back ups of data held for contingency planning. It is your data, you can import and export your data whenever you need to. Link one business to another business and contacts to businesses enables you to keep track of important relationships and ensure your information is always up to date. Link Contacts to a Business – This helps you to build business profiles, by logging which contact you need to speak to within a business. This will help you and your team avoid time wasting, as you will always be able to see who the correct contact is within a business. Link one Businesses to another Business – There are many partnerships and collaborations in today’s business arena, linking business to business enables you to track relationships and speak to the correct people. This will help you to see the relationship they have. It is also useful to show you if the business uses contractors, outsourced solicitors, accountants or self-employed sales people and is great for showing procurement relationships. Assign users to certain contacts and businesses only, giving them restricted access to your database if you need to, this works well for remote sales teams where they are responsible for their own database. This is an important new security feature that only gives that User access to the records that they have been assigned to and not to any other company data on your system. Assign statuses, categories and users to your business and contact records in bulk, instead of having to edit each record saving you and your team valuable time.